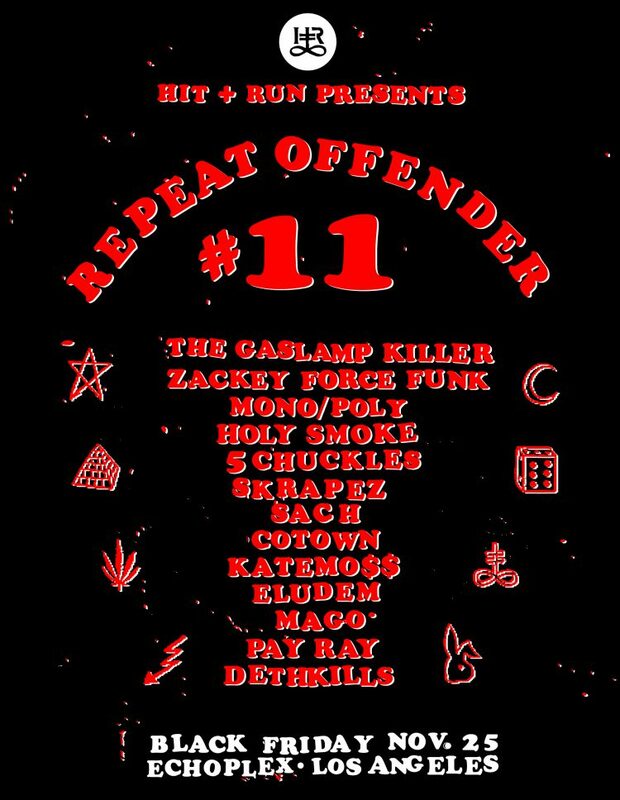 TONIGHT Black Friday, November 25th, we celebrate our 11-year anniversary at “REPEAT OFFENDER #11” taking place at The Echoplex in Los Angeles. We’ve assembled a stellar line-up of LA musicians and are incredibly stoked to have THE GASLAMP KILLER, ZACKEY FORCE FUNK, MONO/POLY, HOLY SMOKE (Zeroh & Jeremiah Jae), 5 CHUCKLES (Ras G & The Koreatown Oddity), SKRAPEZ, SACH, COTOWN, KATEMO$$, ELUDEM, MAGO, plus your Host PAY RAY, live painting onstage by DETHKILLS, sound reinforcement by PURE FILTH, and of course live screenprinting by the HIT+RUN CREW… all together in the house tonight! The first 200 guests will receive a FREE blank shirt to customize through the night with a dozen exclusive designs by H+R, MIKE C, RESTITUTION PRESS, MAGO, COTO, YU MAEDA, BLU MANGO, MARK OF THE BEAST, ENIK, GRAVITY OF THE SITUATION & more. FREE Crew stickers & matches for everyone, plus this year we’ll have a merch area set up selling our fifteen 2016 music releases including records, tapes, cds & books by ZEROH, SACH, HOLY SMOKE, MONO/POLY, LEONARD CHARLES, KUTMAH, SKRAPEZ, COTO, SACRED, ZACKEY FORCE FUNK, CONTACT FIELD ORCHESTRA, ANGELS DUST, “ROAD KILL” box sets and gems from the H+R vault! As all REPEAT OFFENDERS know, just wear your old favorite HIT+RUN t-shirt and get in the door for FREE! You can also pick-up your (guaranteed shirt) ticket online, at the door, or for those who can’t make it this year we’re offering special “NO SHOW” packages that include all the goodies from the night at REPEATOFFENDER.CLUB. We hope to see you there!